Risyad Tri Setiaputra, 27, is registered as a Jakarta resident. Currently residing in Glasgow, in the United Kingdom, he has kept a close eye on every development in the heated Jakarta gubernatorial race through the internet. For Risyad, casting his vote in the Feb. 15 election is important because it will determine the future of the Indonesian capital. “Jakarta is developing now. It would be a pity if the ongoing development faced challenges because of the election result,” Risyad told The Jakarta Post via instant messaging service on Saturday. Going home only to vote, however, is certainly not an option for him. Risyad is originally from Kalimalang, East Jakarta, thousands of kilometers away from the biggest city in Scotland where he has been pursuing his master’s degree. Risyad said he would stay in Glasgow until he finished his course in October. According to Risyad, a student at Glasgow Caledonian University, the Indonesian Students Association (PPI) UK had consulted the Indonesian Embassy in London on how Indonesians living abroad could participate in the regional elections, which will be held simultaneously in Jakarta and 100 other provinces, regencies, and cities in Indonesia on Feb. 15. The embassy said it only set up polling facilities during presidential and legislative elections. “Master’s students will mostly stay in the UK, while PhD students could possibly return to Indonesia because they have longer study times and hence more spare time,” said Risyad, who cast his vote in the 2012 Jakarta gubernatorial election. In contrast, 29-year-old Lius Putra, a registered resident of West Jakarta, who moved to Singapore in 2006, said he was planning to return to Indonesia to cast his vote in the gubernatorial election. He said he felt the need to contribute further to the development of the Indonesian capital. “Even though I’m physically not in Jakarta, I feel a sense of duty and responsibility as a Jakarta resident to ensure the continuation of that development. It’s my hope to see Jakarta evolve as a better city. That’s why I choose to return,” said Lius, a compliance professional in the financial services industry. “The coming election will be a turning point for Jakarta to see whether the development that has been in place since 2012 will be continued, or if there will be a drastic change in policy,” he said. Lius said a lot of his Indonesian colleagues in Singapore had also expressed their desire to return to Indonesia to vote but decided to stay in the city state as they had to work. His wife had also decided to do the same, Lius said. 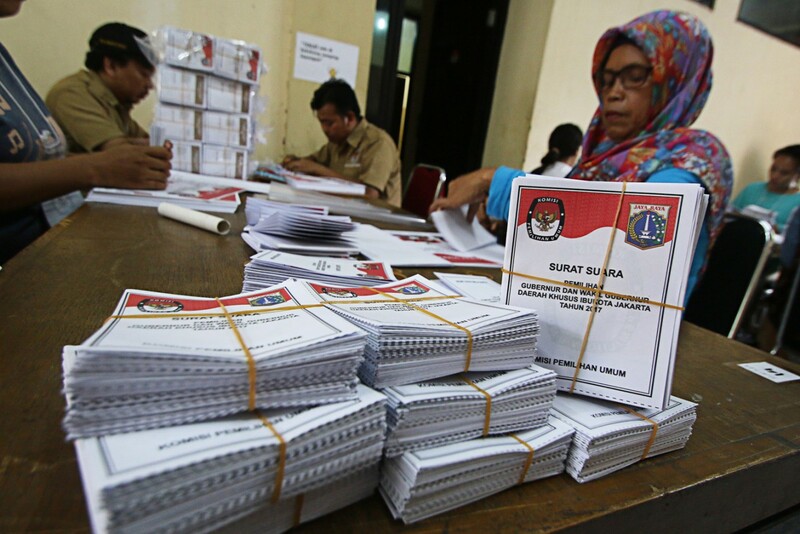 General Elections Commission (KPU) commissioner Hadar Nafis Gumay said that only registered voters currently residing in the country could cast their votes and there would be no voting stations opened outside Indonesia to accommodate Indonesians living overseas. Post on Saturday. Hadar acknowledged that it would be costly if a similar obligation was also implemented in regional elections. permanent voters list [...] as they were recorded as Jakarta residents when our officials gathered and compiled the data on voters,” KPU Jakarta commissioner Betty Epsilon Idroos said as quoted by kompas.com. “The Jakarta gubernatorial election is a local event, not a national one. The only way to exercise their voting rights is by coming home to Jakarta on polling day,” Betty said. It is not actually known how many Indonesians abroad are eligible to vote in the upcoming regional elections. During the 2014 presidential and legislative elections more than 2 million overseas Indonesians were registered as eligible voters.